This is the third iteration of the server manager. Made improvements large enough that I thought it was okay to resubmit as a new snippet. By right clicking on a Status, Query or Channel, you'll have the option of popping up the dialog for the script. Can add as many servers to the autojoin list as you like, with the ability to enable/disable autojoining them via the manager. If you wish to connect with a different port, add a colon and the port after entering the server. e.g. 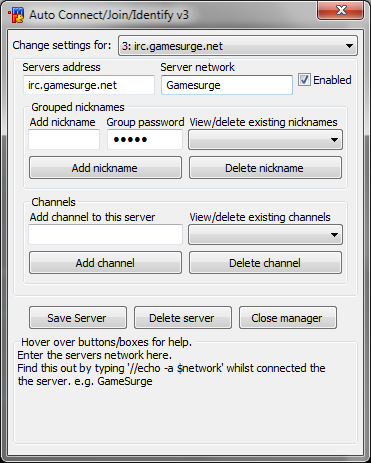 "irc.gamesurge.net:6667"
Can add as many channels for each server as you like. If you wish to join a channel with a password, simply type the password after the channel. e.g. "#channel password"
PSS: I know there's a particular big with choosing the 'next free nick' if your nick is taken, i'll edit the snippet once I work out how :p Still works, just not the way I intended. ;If no servers are set up, or if "Add a new server" is selected, disable some entry fields and rename buttons. ;When mIRC starts, connect to each of the servers in the Settings.ini file with the primary nick supplied, if there is one. ;-- $2 is the current nickname, find it in tokens and try the next one. ;called by $rs(server number, item) - if server number is 0, then general settings are stored. it would be awesome if you could edit the login command. I'll be rewriting this again at some point. I didn't like auto-ghost, because it interferes sometimes, and I don't actually have oper on any servers, so never really thought about adding it in. (I'll add it in the next version =3). :+port in the server address field. (e.g. : irc.server.net:+6697), or whatever port is used. so how to install this well written script into mIRC? Excellent script mate, give you a 9 for this, ChiefDean is right though, a port feature would improve this.